I love late summer. It’s not deathly hot outside and the air is comfortable and breezy. I love how the sun sits low in the sky and gives everything a golden, rosy glow. Everything seems much more precious because soon autumn will set in and the nights will soon require sweaters and then jackets. But right now? Everything is perfect. With the slightly cooler evenings that this late summer provides, I think it’s time to bake up a quick little meal that is as fresh as it is hearty. It’s chock full of vegetables from our CSA: beet greens along with their candy cane stems, garlic, onion, sun gold tomatoes, and summer squash (of course). These get sautéed on the stovetop along with a little sweet red pepper and herbs. A cracker or breadcrumb topping, of course! I dig the crunchiness and the comfort it provides. Though if you do decide to smush your own crackers like I did, grind ’em up fine or you’ll end up with something more rustic. A finer crumb would have worked better, I think. Add on some more grated cheese and then pop it in the oven to get everything melted and golden like the evening sun. There you go, a splendid late summer meal. Enjoy! elsewhere: Over at Poppytalk I bake up a deliciously moist spiced zucchini bread. You’ll need this recipe handy if your squash drawer is anything like mine. Also, I just started writing for the Huffington Post and you can read my first post about homemade maraschino cherries! 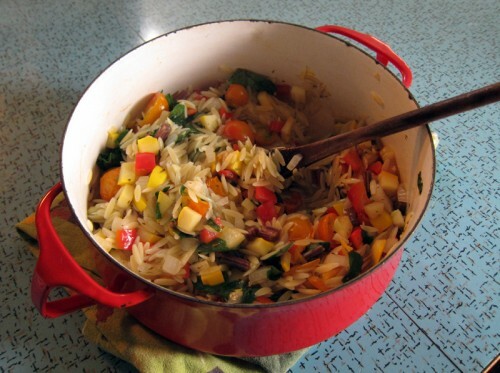 While this is a rustic dish, try to keep your vegetable dice small to match the orzo as it makes for better bites. Meanwhile, heat olive oil in a medium sized oven-safe pot over medium heat and add in the onion and garlic, sautéing until translucent. 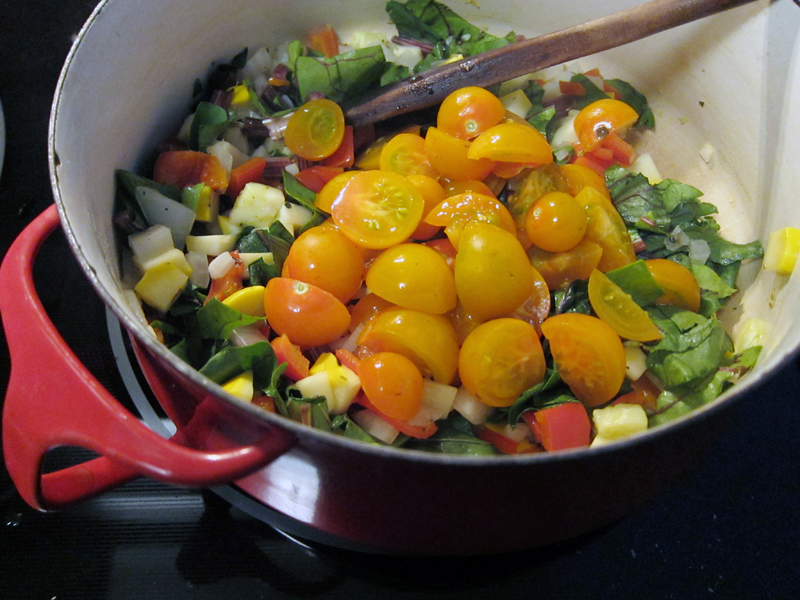 Add in the zucchini, tomatoes, red pepper, and beet stems and greens along with the herbs, salt and chili flakes. Stir until tender-crisp, about 5-8 minutes. Drain orzo when al dente and return to the pot. Add in the vegetables, along with the milk and the spaghetti sauce. Add in the cheddar cheese and stir until well combined. 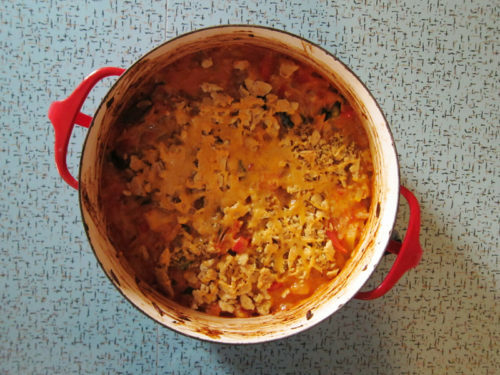 In a small saucepan, heat the olive oil and add in the oregano and the crushed crackers or breadcrumbs, stirring until well mixed & slightly fragrant. Top the dish with the crumbs and the reserved cheese and bake uncovered for 20 minutes, or until the top is golden and melty. Remove from oven. Serves 6. Splendid indeed! This looks delicious! I appreciate all your creative vegetable dishes, and I’m a big fan of Huffington Post. Congrats! I love how this kind of like baked ziti or mac and cheese…but five hundred thousand times healthier and chock full of veggies! I kind of wish late summer could last forever if it means I could eat this every day. Thank you, Donna! 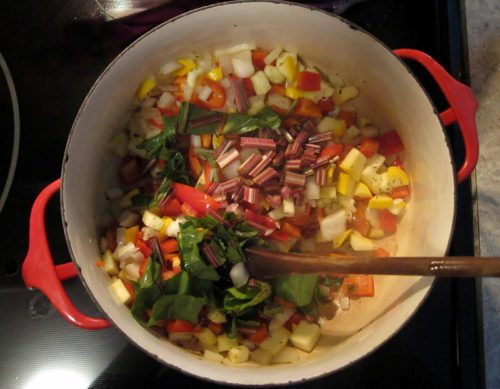 With our CSA giving as it currently is, I see lots more vegetable dishes in my future. Ali, I hope you do! Nicole, I love that red pot too – a thoughtful xmas gift from Cornelius. Late summer = agreed! this looks absolutely delicious – i have never cooked with orzo pasta before – i tend to stick with the fusilli or penne.Is it easy to work with? Jade, yes, super easy and it quicks much sooner too because of its small size. You could easily sub any kind of short pasta here, like penne or fusilli. 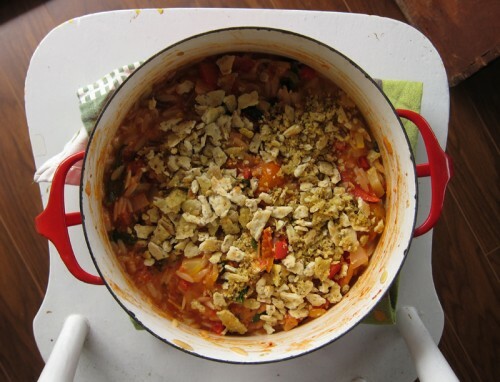 you come up with the most creative “all in one pot” meals that are not only tasty but healthy too. Oh, how I enjoy eating orzo. You know I never thought to add cheddar cheese to it but I just love the sound of that. Usually with orzo I stick to the Italian influence and just add parmesan or feta even. Which actually isn’t Italian but well, you know 🙂 Baked pasta dishes are definitely on my radar for this fall season. Just made this with farmers market veggies– amazing. Thanks for the great recipe! BethP, so glad you enjoyed this!! Thanks for letting me know. ohhhh yum… not only does this have beet greens and tons of tiny tomatoes, but its cheddar + rose sauce? mm, best fall welcome ever! I just made a macaroni and cheese with bacon and scallions yesterday, but this sounds honestly way more special. Elizabeth, it is pretty special and a great way to use up all the vegetables you’ve got languishing in your crisper. Thanks Christy, enjoy – it’s a good one! 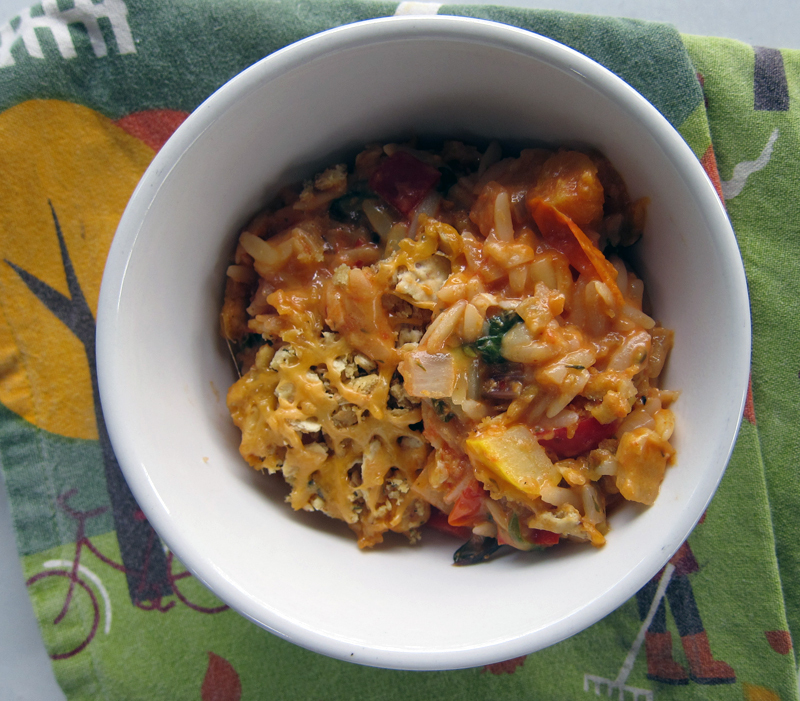 I made this using farro perlato instead of orzo. Farro’s a whole grain, so it imparts a nuttier flavor than orzo, and I think it’s bulkier, so I used less. Judy said it was “odd but good” which was probably more about my substitution than your recipe (I like it). Please consider adding cherry tomatoes to the instructions, and indicate whether the dish should be covered in the oven or not. I did, and probably shouldn’t have. Robert, amended the recipe with the cherry tomatoes. Glad you’re enjoying the print feature! I somehow forgot about this recipe and hadn’t made it probably a couple of years. I miraculously had all the stuff* to do so yesterday and wow! I’d forgotten how delicious it was!! I now have leftovers for days and I’m not sharing. *Actually I didn’t have bread crumbs or crackers except Panko crumbs and those worked amazingly.